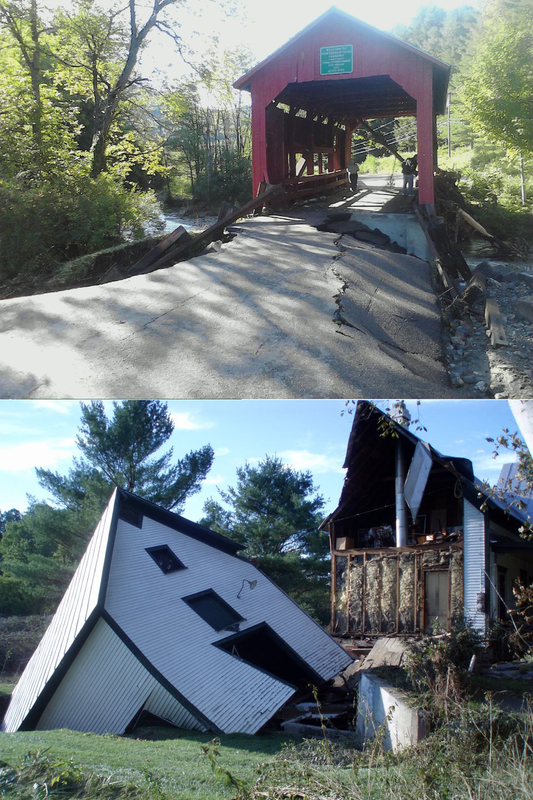 Damage in Vermont from Irene - (top) Northfield Falls Covered Bridge; (bottom) Damage in Bethel. These photos and others are on "Vermont Flooding 2011" Facebook page. Want a chance to do the most rewarding work of your life? Don’t hesitate; the time is now in Vermont. I spent Thursday helping folks in Richmond, Vermont muck-out, throw-out, and clean-up from flood damage. It was some of the dirtiest, hardest, most humbling and gratifying work I’ve ever done. The house I worked at, a quintessential 1840s brick Federal (that’s the historian in me – can’t turn that off), was flooded to about 2 feet in the first floor. They pumped 30,000 gallons of water out of the basement. On scene were the owner, her daughters and sister, two family friends, two staff from Waitsfield/Champlain Valley Telecom and two folks who just showed up. Being among the latter, I was welcomed with opened arms. The first floor was a mass of ruined furniture, paperwork, appliances and family heirlooms. The drill was not complicated: take it all out with the owner giving instructions to keep or toss. With everything out, we gutted – trying to get every sodden piece of the house out before the mold takes over. Today, my muscles ache, but no complaints here – I went home my cozy house, while that family is still working hard to put the pieces of their lives back together. This is where you come in. Go help. Figure out where you are needed, if it’s safe to go, and go help. If you can’t shovel muck, donate to one of the many agencies helping with the recovery. Go to http://802rescue.blogspot.com/ There is a spreadsheet that has an updated list of the towns that are ready for volunteers and specific links to town recovery websites. Go to the Town Clerk website where you are interested in volunteering – many towns are coordinating volunteer efforts through the town clerk. Many towns have specific recovery websites or facebook pages. Google them to figure out where you’re needed. Hopefully, I’ll see you out there this weekend.